Who Are Nepal's Sherpas? : Parallels Members of this Nepalese community are renowned for their climbing skills and remarkable endurance at high altitudes. They are paid well by local standards, but it's a job fraught with risk. A truck carries the body of Ankaji Sherpa during a funeral rally in Katmandu, Nepal, on Tuesday. 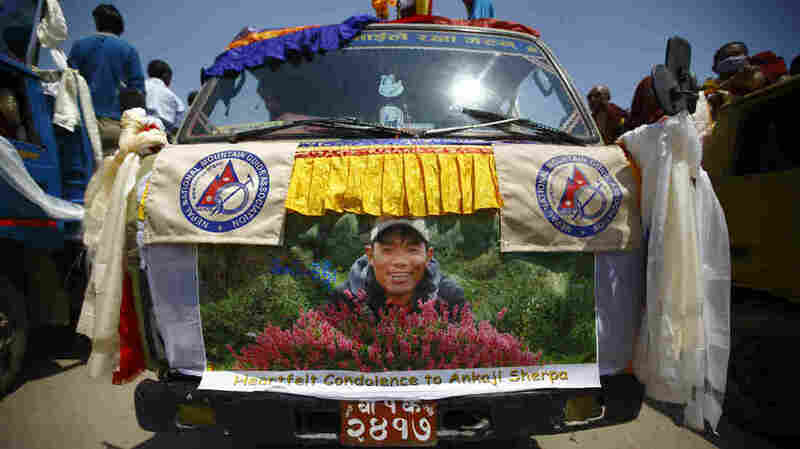 Ankaji Sherpa died last week in the avalanche that killed at least 13. The climbing season on Mount Everest is still in doubt after last week's disaster on the mountain in which 13 Sherpas died and another three are missing and presumed dead. As Mark Memmott notes over at our Two-Way blog, it was the single deadliest day on the mountain. But just who are Sherpas, and what exactly do they do that makes them so invaluable to mountaineering? Here are some answers. Sherpas are a Nepalese ethnic group numbering around 150,000. They are renowned for their climbing skills and superior strength and endurance at high altitudes. Perhaps the most famous Sherpa was Tenzing Norgay, who in 1953 was one of the first two men — Edmund Hillary was the other — to climb Mount Everest. Sherpas act as guides and porters, and do everything from carrying the loads to setting up the camps. They secure climbing routes, fix lines, ferry supplies and guide clients to the top of Everest and other Himalayan peaks. "A Sherpa working above Base Camp on Everest is nearly 10 times more likely to die than a commercial fisherman — the profession the Centers for Disease Control and Prevention rates as the most dangerous nonmilitary job in the U.S. — and more than three and a half times as likely to perish than an infantryman during the first four years of the Iraq war. As a dice roll for someone paying to reach the summit, the dangers of climbing can perhaps be rationalized. But as a workplace safety statistic, 1.2 percent mortality is outrageous. There's no other service industry in the world that so frequently kills and maims its workers for the benefit of paying clients." Climbing Everest is no longer the realm of the individual elite climber; it's a big business worth hundreds of millions of dollars to the country. Expeditions start at about $30,000 and can run as high as $100,000 per person. Permits range in price from $25,000 for an individual climber to $70,000 for a seven-person team. "Sherpas aren't provided with nearly as much bottled oxygen, because it is so expensive to buy and to stock on the upper mountain, and they tend to be much better acclimatized than Westerners. Sherpas are almost never given dexamethasone prophylactically, because they don't have personal physicians in their villages who will prescribe the drug on request. And perhaps most significant, Sherpas do all the heavy lifting on Everest, literally and figuratively. The mostly foreign-owned guiding companies assign the most dangerous and physically demanding jobs to their Sherpa staff, thereby mitigating the risk to their Western guides and members, whose backpacks seldom hold much more than a water bottle, a camera, an extra jacket, and lunch." What's in place to protect them and their families? In his article for Outside, Schaffer notes that Nepal's trekking agents are required by law to buy life and rescue insurance for their porters. Those Sherpas who work above base camp get $4,600 in death coverage and $575 in medical coverage; low-altitude porters are insured at $3,500, Schaffer wrote. Additionally, each expedition covers its Sherpas, collectively, with a minimum of $4,000 in rescue insurance. But, he told NPR's Audie Cornish, the effect of a fatality or injury has severe implications in the villages. "Well, this is sort of, you know, the unseen tragedy of Mount Everest, which is the fallout back in the villages. I mean, these villages in the Khumbu are tiny, 40 or 50 houses. And in each of these villages there are houses with missing men where widows and orphans have had their husbands and fathers taken from them by the mountain. When a Sherpa dies, there's usually an insurance payment. In years past it's been about $4,000. "Just for this season the government raised the minimum requirements to about $11,000. But that's still — you're talking about $11,000 that needs to go to replace the income a worker would have for 10 or 20 years. There's a huge ripple effect that goes unseen by the climbing world."